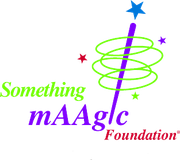 There are many ways you can help make mAAgic happen. While our marquee event, mAAgicsm flight, happens one time each year, our fundraising efforts are year-round. Your direct donations are always welcome - there is no amount too small! - but there are other ways you can help, including buying products you would buy anyway, volunteering, and surfing the Internet. And be sure to tell your family, friends and coworkers about us!